No. it’s not a typo. I do mean Sidney. We do not live in Australia. We have not even visited Australia. Yet. Sidney is, if we’re to believe the guard on our commuter train into Liverpool, employee of the month. We don’t see him. But we hear him. He has a distinctive voice. If I say ‘Chipmunks’ or ‘Pinky and Perky’ some of you will know exactly how he sounds, but for the rest of you – well, he’s plainly been at the laughing gas. It isn’t the only odd announcement of the day. Fresh from Sid’s squeaky admonition to pay for our ticket before boarding the train (of course we did) comes the disembodied voice on our ‘Pendolino’ (yes, it leans into the bends) train to London. I drank plenty of water on top of my three cups of tea at breakfast. The lockable room between carriages beckons. As I make to flush the loo, the voice is speaking. Telling me what not to flush. Was that really ‘unfulfilled dreams and goldfish’? Our first really, truly, proper holiday since 1997 and it’s beginning to feel a bit – well, surreal. A mere five or so hours after leaving home (yes that’s sarcasm) we’re at Heathrow. Which does nothing to rebalance the weirdness/normality quotient. It’s not that I haven’t travelled in-between the proper-holiday-less years – there have been many trips to Zambia and to Texas, one to Ghana, – but we’ve not flown via London. And I’d forgotten what a shadow world Heathrow is. Time slips out of reality. Life-forces cease to exist. A soulless, air-conditioned morgue of an express train whisks us into a grim well of greyness. The terminal. Such an apt description. I’m sure the ‘décor’ is meant to be soothing or chic or minimalist or something (or just easy to maintain?). But it transports me straight into the bad bits of Metropolis. I imagine tromping, mesmerised hordes with cold eyes. I’m one of them, no longer a being with her own volition. But then I do, arguably, have too much imagination. At the end of the inanimate moving stairs, the ballet of wheeling suitcases successfully pas-de-deuxed, it’s the turn of the shops. Empty of customers. Big-eyed, gazing windows. Stocked with prestige (aka ridiculously expensive) products. Bars selling caviar and champagne. And Zara. An ordinary shop with a sale on. I buy a scrunched-up, huge, bright orange wrap of a scarf – for a pittance. It makes me feel like a rebel amid the Burberry, Gucci and Hermes. And so, at last to our British Airways flight. So far, I haven’t met anyone who’s heard of ‘Vueling’(pronounced voowailing). Anyway. The Vueling flight is full. Chocker. And we’re on time. But then the man with the yellow high-vis jacket appears in the front. Announcements? No. Not a one. I expect any minute to be told some luggage is missing and we all have to disembark – but then I always expect the worst. Which means I often have pleasant surprises. In fact the yellow jacket vanishes, the plane revs up and we taxi away to a bumpy take-off. Such announcements as there are come in Spanish. The safety stuff, for the Brits, comes in a nice, clear, recorded English message. During the flight there is one announcement by a member of the cabin staff in English. Almost totally incomprehensible it tells us we’ll be arriving at twenty past. Yes. Twenty past. That’s all we could understand – the hour was indecipherable. Good job we have a smattering of Spanish between us. As we near our destination the hilltops of Galicia are verdant in the early evening sun – and almost every one is scattered abundantly with windmills, their pale arms turning to generate renewable electricity. 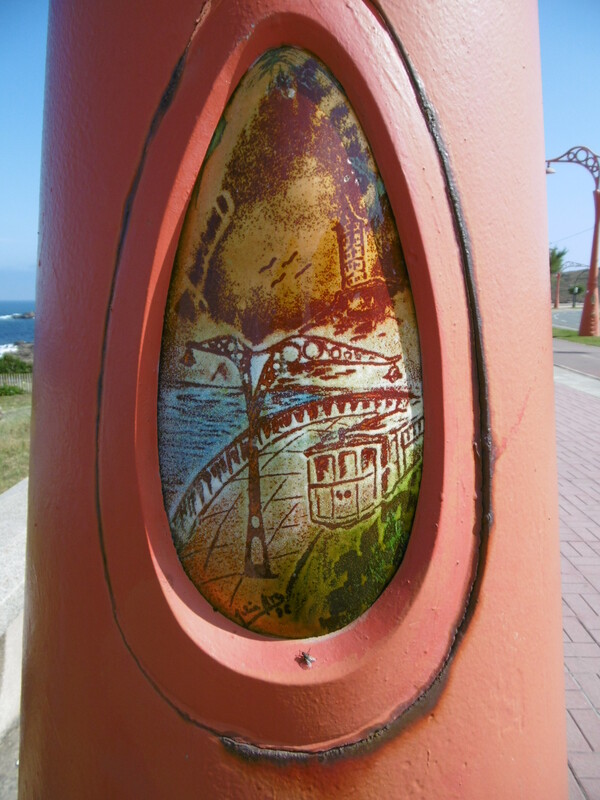 A spectacularly good landing deposits us at the tiny hilltop airport of A Coruña. There, a grumpy policeman waves us through passport control the instant he sees our British passports. In the arrival hall/baggage reclaim area, thronged with people, none of the officials seems to speak English. We realise we should have revised. ‘¡Hola! Buenos dias,’ only gets you so far. But the rusty Spanish is trundled out and a nice man dredges up some broken English to meet us halfway. Yes, he says, there’s a bus, every half hour. But it’s not really that far – it won’t break the bank to take a taxi into town. So we do. The port’s industrial – we knew it would be – but as we spiral the freeways past the high-rises and dive down into the heart of the city the excitement mounts. Will we have a sea view? The hotel is fab. Vast walls, floors and stairs of palest marble. A sea view (for an extra 16 Euros for two nights). Put it this way – we’d go back just for the food. 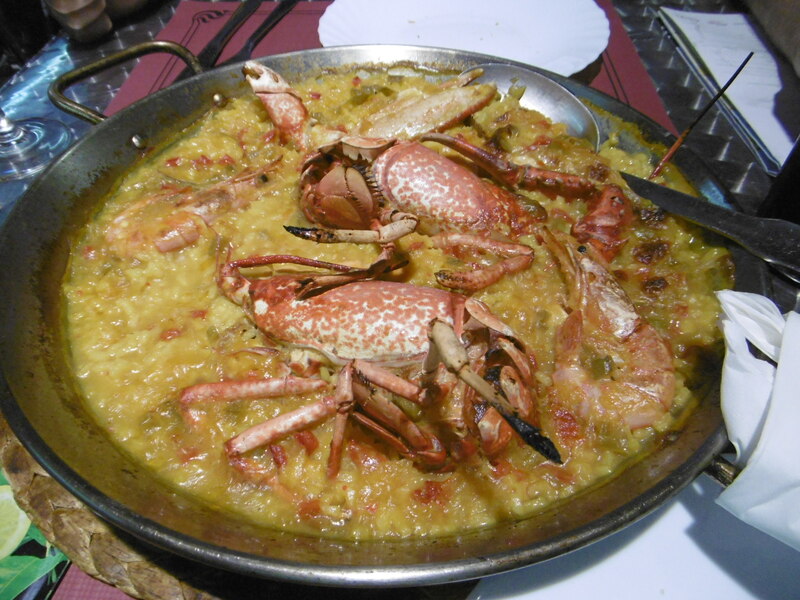 After a decent night’s sleep, a meal of arroz con bogavante – rice with lobster and other marine creatures – and a bottle of white Albariño wine we’re ready for new experiences. We spend a while gawping at the view – but breakfast awaits. 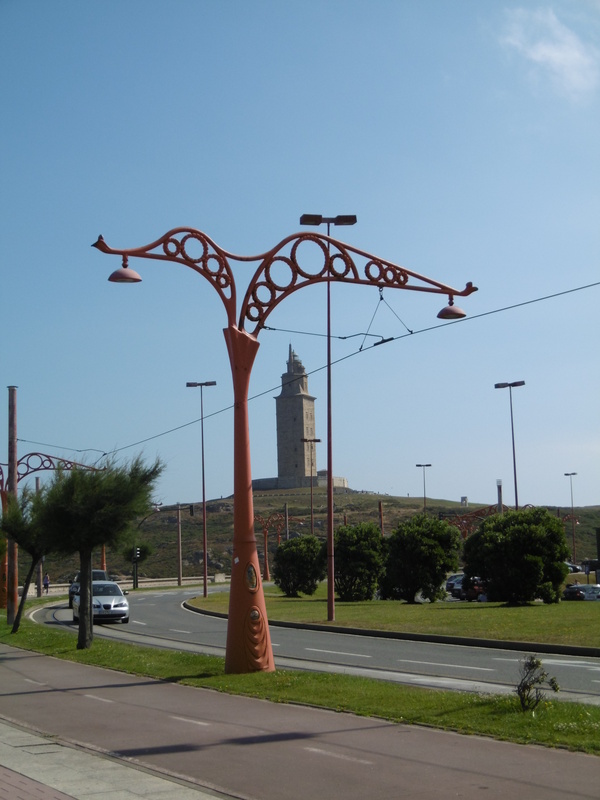 That and the Farum Brigantium – a Roman Lighthouse now known as the Tower of Hercules. 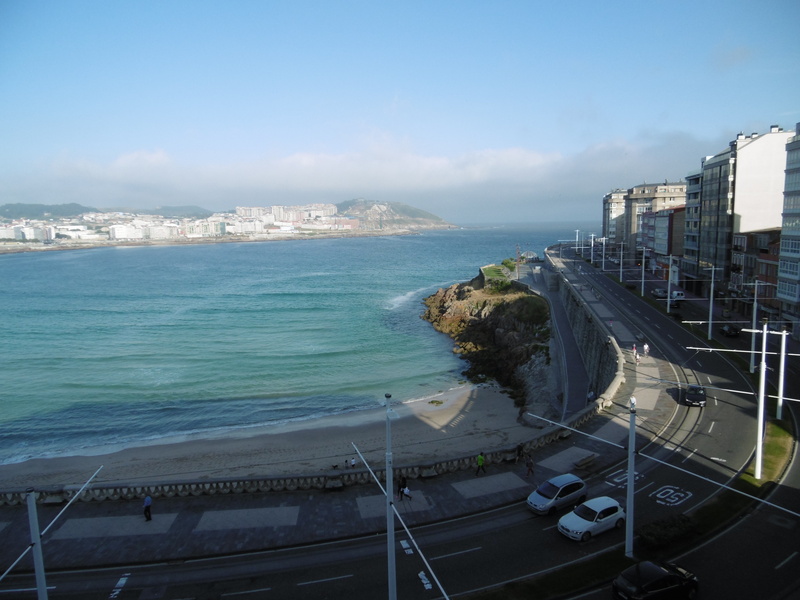 A Coruña was the Roman city of Brigantium. The Roman lighthouse is now a World Heritage site. On top of a hill. A steep hill. My first since the op. An excuse to eat a large breakfast of small things. Squares of fish and pimento tart (empanadas). Slim finger sandwiches of air-dried ham and tomato paste. Pineapple and watermelon, melon and kiwi fruit. All washed down with French lavender tea. Better than it sounds, honest. And so, replete, off into the sun – and up the hill. 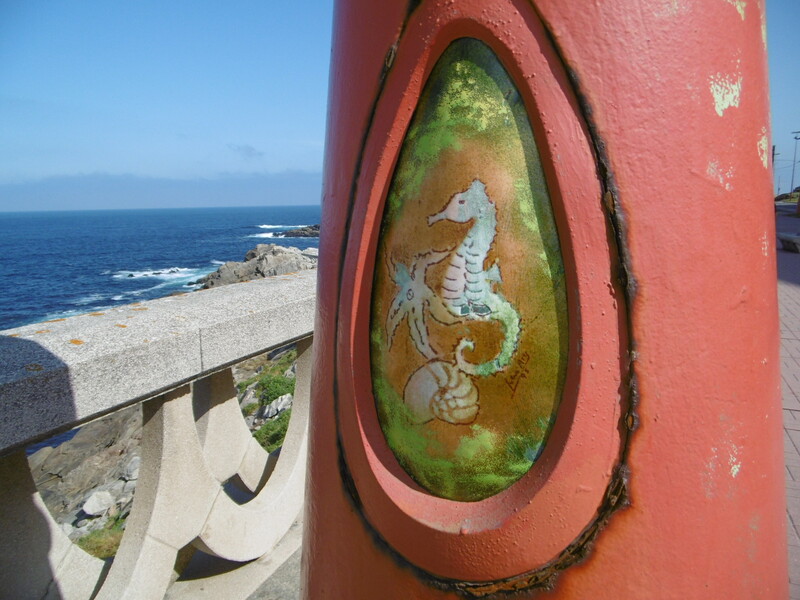 This entry was posted in Travelling and tagged A Coruña, Albariño, bogavante, Brigantium, Galicia, Heathrow, lobster, Tower of Hercules, train journeys, Vueling, windmills. Bookmark the permalink. Deep pleasant sigh… of pleasant envy and vicarious enjoyment… all the way from the other Sydney! Some of the train guards really own their jobs and put their characters into it… with mixed results. Some are truly entertaining, and some ought to come with a health warning.. so loud and so long… I often wonder if they do it as revenge on the hoards of unruly commuters. There’s one exception to finding joy in the journeys of life, and that’s flying. I’m less resilient as I get older. The G.O. refers to it as torture. But I do enjoy a browse in the airport shops mainly because they are so empty! Thanks EllaDee! I’m with the GO on flying. There’s more food to come. And FAR too much walking mostly up hills and steps 😦 But it was rather wonderful and the food really was so good it’s hard to belive how cheap it was too. That’s partly the Euro exchange rate with the pound but partly just fresh food is so available and so good and cheap. You’d LOVE it. 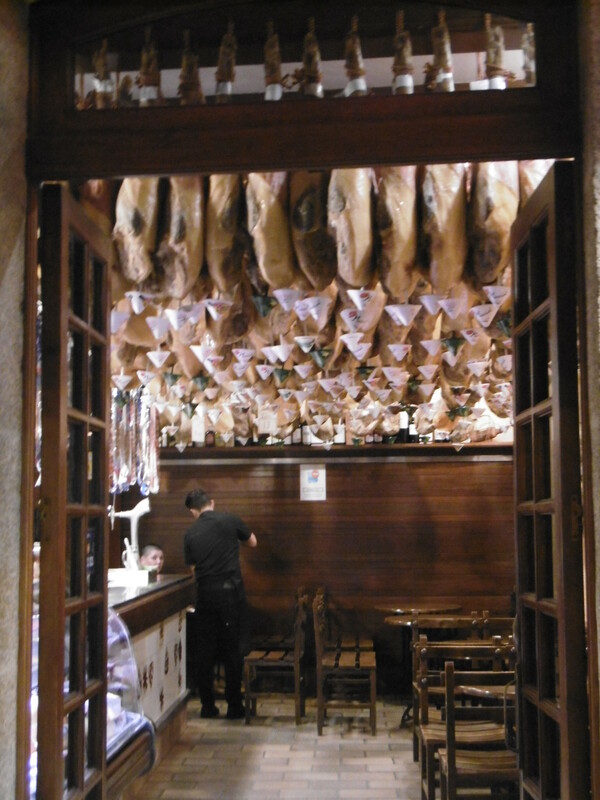 The only thing was I began to miss vegetables – we seemed to eat mostly fish, fruit, some pastry and meat. But not complaining at all! Still. good to be back too.